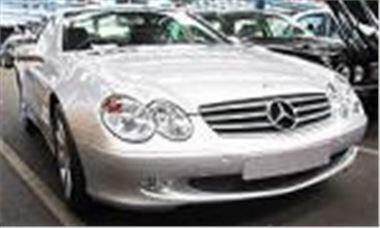 A brand new Mercedes SL500 imported from Germany just a week ago and with a mere 220 miles on the clock sold to a man with a bag of money for £74,600. While that looks like more than list, the car was well specced up with satnav, CD autochanger, leather and silver paint so, if not bang on UK list, was very close to it. A quick call to Tom Hartley www.tomhartley.com, who has a LHD 52 reg SL500 up for just £57,950, confirmed that the price paid today was as good as you’d do for a new RHD SL500. Another premium car was represented today by a 33,000 mile 2001/51 reg BMW X5 3.0D auto with leather but without the Sport spec wheels and bodykit. Though it bid to £35,700 (roughly the new price for that spec), traders I spoke to reckoned it would be hard to move on without the Premier Division pack because that’s the way the market wants them. Other heavy metal included a 19,000 mile 98S Bentley Turbo R 400 LWB that bid to £41,750; a 4,000 mile 2000W Ferrari 465M automatic bid to £78,750; and a 31,000 mile 99T Porsche 996 Carrera 4 cabrio with hardtop, sold for £40,500. Downscale a bit, a 3,000 mile 02 reg Landcruiser 4.2 VX Active sold for £34,000; a 52,000 mile 2000X S320 CDI bid to £30,900; a 16,000 mile 2001Y SLK 320 auto sold for £24,500; a 45,000 mile 2000X BMW 740i bid to £23,400; a 60,000 mile TVR Chimaera 5.0HC bid to £22,500; a 5,000 mile 2001/51 Jaguar XJ8 3.2 Executive stuck at a disappointing £22,300; a 56,000 mile 99S AMG E55 (like Quentin Willson had) sold for £20,400; a 46,000 mile 2001X C320 Avant Garde sold for £19,800; and a 60,000 mile 97P BMW 840 CI coupe sold for £14,500. Among the fleet cars in the other halls, a 116,000 mile 99V BMW 530D SE auto bid to a low £10,350; 113,000 mile 2000X Skoda Octavia TDI SLX bid to a strong £4,450; a 33,000 mile 99T SEAT Toledo 1.8S bid to £4,725; a 36,000 mile 99V Toledo V5 bid to £6,375; and a 99,000 mile 99V Mercedes C220 CDI Esprit manual in silver with a/c looked like quite a good buy at £8,100.